It’s that time of the week again! This week we’ll be talking about the Colorado Potato Beetle (Leptinotarsa decemlineata) and Green Weevils (Polydrusus sp. 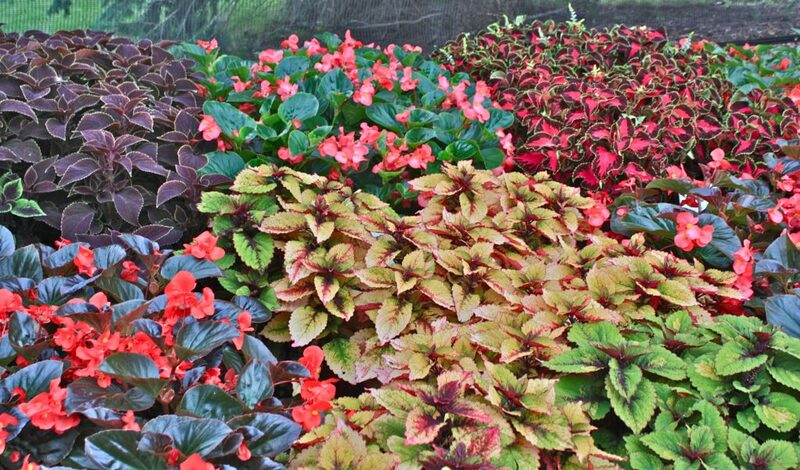 ), both of which made their debuts this week in our trial beds. We started seeing our first Colorado Potato Beetles (below) around the station this week. This beetle is one of the most problematic pests for potato and eggplant growers in the nation, and is particularly known as being a poster-child for insecticide resistance, having developed resistance to several classes of these pesticides. The Colorado Potato Beetle (above) is native to North America, and overwinters as an adult, digging into soil in sheltered areas near a food source and emerging in the spring once foliage begins to develop. Adult females lay clusters of yellow-orange eggs on the undersides of host plants in spring and early summer, and larvae emerge and begin to feed a few days later. The larvae of the Colorado Potato Beetle are extremely aggressive defoliators, and can destroy enormous amounts of leaf tissue very rapidly using chewing mouthparts. This destruction of leaf tissue can lead to decreased yields and, if untreated, eventual plant death. 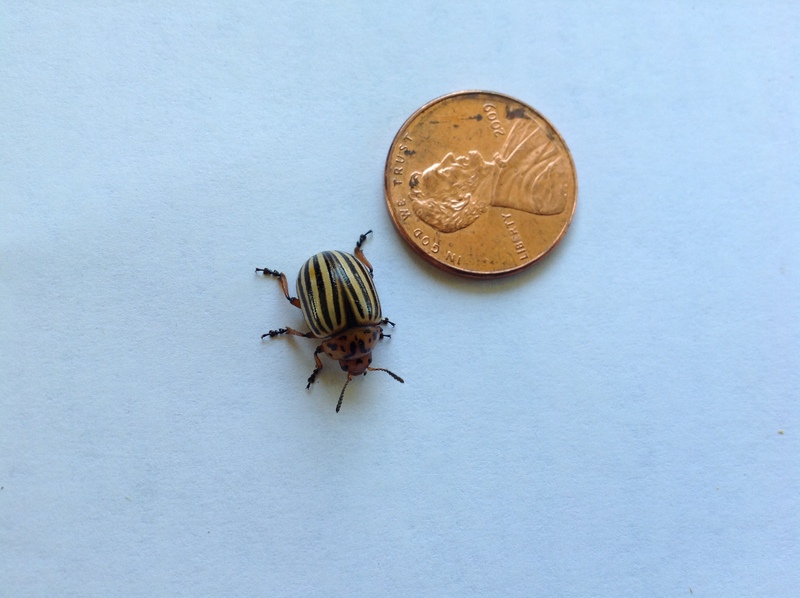 If you’re growing crops that the Colorado Potato Beetle consumes (in our area, potato or eggplant), this is a good time of year to be keeping an eye out for adults, eggs, and larvae. Be sure to check both the top and bottom sides of leaves. Keep a particular eye out for adults along the edge of your growing area, as the Colorado Potato Beetle crawls on the ground into fields after emerging from its overwintering site. Larvae are most often found grouped together and feeding on newly expanding foliage at the growing points of a plant. Picking adults and larvae off by hand should be sufficient for all of you home gardeners out there, but make sure to wash your hands – Colorado Potato Beetles contain a chemical that can cause irritation to sensitive skin! Next we’ll talk about Green Weevils (Polydrusus sp. ), pictured below. There are a couple of Green Weevils in the genus Polydrusus that occur in our area, but their impact, life traits, and appearance are similar enough that they’re being lumped together in the blog for the sake of keeping things simple. 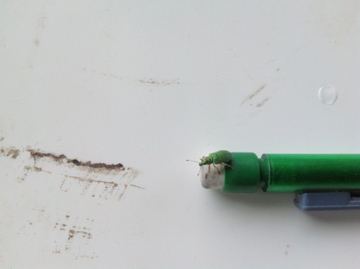 While Green Weevils are very conspicuous and are not native insects (they’re European in origin), they typically cause very minimal damage to the plants of the average home gardener or landscaper. Adults nibble on the edges of leaves of a variety of trees found in our area, some showing a preference for birch. Larvae feed on small roots of the trees that adults consume leaf tissue from. In spite of the fact that both life stages feed on plant tissue however, this insect rarely causes significant damage. So, while you may often see these beautiful weevils around your home or garden, don’t worry – they’re not typically feared as a pest, and very rarely cause damage that would be deemed significant. And that’s all, folks! You know the drill – same time, same channel, next week and all summer long. Thanks for reading.